Kelly has been my best friend since sophomore year of high school. We were just people who went to school together and had classes together until then, but we slowly realized that we both loved crossword puzzles [and were consequently the coolest of people]. We were still just sort of friends when she invited me to NYC over Spring Break with her and her mom. She wanted me to go so she wouldn't be alone with her mom for 5 days, and I wanted to go because her mom said she'd pay for everything but the plane ticket. Best decision ever. We spent 5 days touring art museums and cemented our friendship over coffee, puzzles, and the ability to pack for a vacation in just a Jansport backpack. College came around and she went to MIT, while I stayed in Florida at UF. She came home once a year and I visited her twice up there. I spent summers working and she spent them in places like Sierra Leone, India, and Singapore doing internships for her architecture program. I hope you can tell by now that she's super awesome? Last year when she graduated from MIT she decided to go to grad school at Berkeley for urban planning, so now she lives out in CA, and we still only get to see each other for about a week a year. Plane tickets to CA are pretty hefty, so I haven't gotten to visit her yet. Whenever she comes home I clear my schedule and try to spend as much time as possible with her. 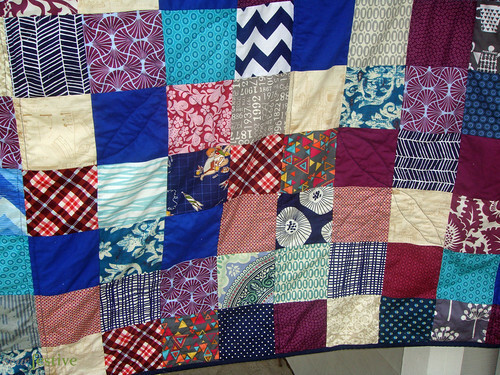 At Christmas she mentioned how much she liked Stephen's simple patchwork quilt and sort of asked for one. Then later in the spring she said she wanted to pay me to make one, but felt weird paying me, so she'd send me presents in exchange for a quilt. I said sure, and got started collecting fabrics. And then in April she mentioned she wanted to use it on her new queen-sized bed. And I stalled. 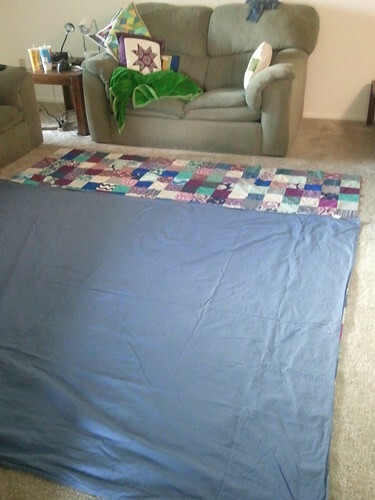 Feeling very unsure of tackling a queen-size quilt. 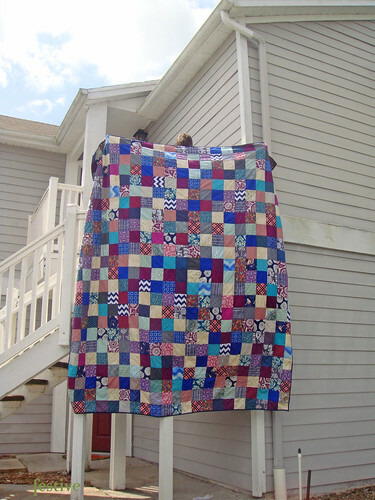 This quilt is made up of 510 five inch charms. It measured about 95x108" before washing. Stephen is oh-so-nicely holding it up when it's damp, because I plum ran out of time for it to finish drying before I had to meet Kelly. Which is why all these pictures are just "meh". Hopefully the quilt crinkles more! Many people expressed interest in what I ended up doing for basting. I had to move all my furniture as far back as possible in my living room in order to accomplish this. I've tried taping the backing to the carpet as you would for hardwood floor basting, and it does not work for me. So I lay the batting out on the floor, then spray baste each side to it individually. This time I tried pinning the batting pieces into the carpet so that it would remain taut...it didn't work exactly how I'd imagined it would, but maybe that was just user error. Apologies for the picture, but this was an afterthought as I was running out the door. There was no way in hell I was going to piece a backing after piecing the top, so I pulled out a queen-sized flat sheet I had on hand. Too small. I had to run out and get a king-sized sheet, and it was juuust big enough. 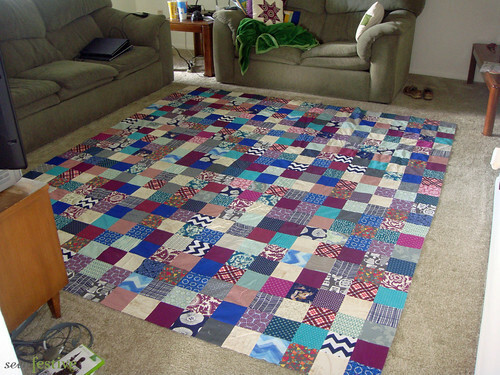 How long did this whole quilt take me? Well, I sewed the first 28 [out of 56] nine-patches, and then I was SO BORED. So I pulled out my computer and Season 1 of Veronica Mars. Kelly and I LOVE this show. Love. Spunky female detective played by Kristen Bell? Yes please. Watch it, love it, thank me later. 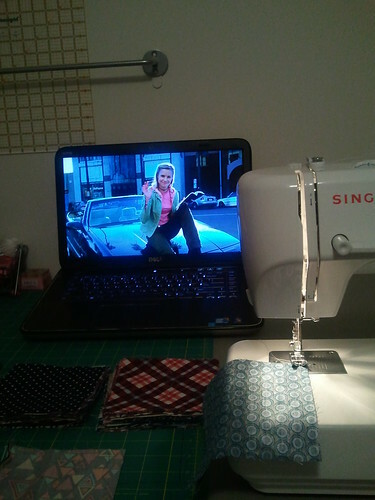 I watched the entire first season [22 episodes at 45 min per episode] while piecing the rest of the top together and quilting it. I had to bind it without any TV distractions. So I would say the whole thing took about 25 hours to piece, quilt, and bind. 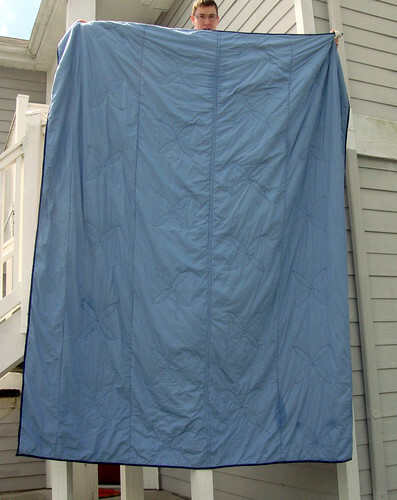 The picture above shows a few things: 1, the quilt is clearly still wet, so I hope it ends up looking better from the back when it's dry, and 2, that it's fairly lightly quilted and looks like it could be basted better. I can't wait for the day when I'm a professional baster and those quilts are as flat and smooth as can be. 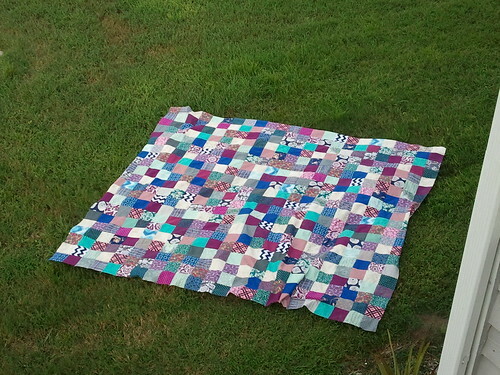 Because this quilt was a beast, I knew I wouldn't be able to quilt it as much as I might normally quilt. So I put some straight-lines down the quilt every 4 rows, following the seam lines. Then I added some free-motion flowers using the squares to help guide me. I quilted a single petal in each square. 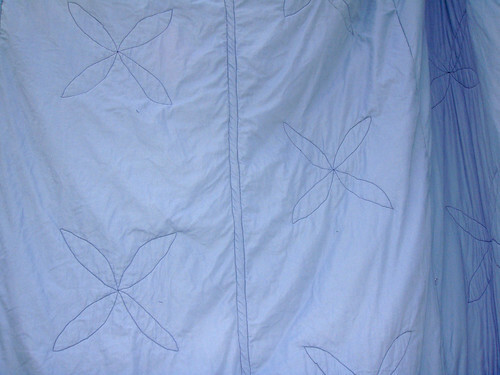 Every other row I alternated where the flowers started so that they would be staggered on the back of the quilt. The flower part of the quilting actually went really smoothly...during the straight-line part I could feel my soul shriveling up inside. Ha! 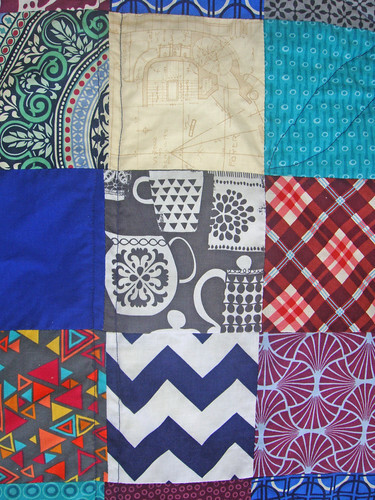 There are a few special fabrics in this quilt just for Kelly: the Children at Play rocket print that she loved from Stephen's quilt and is a nod to the smarties at MIT, the Etchings blueprint fabric for her architecture degrees, and the gray Michael Miller Catherineholm enamelware print to celebrate our obsession with coffee at any time. Oh, and then as my last present in exchange for the quilt she gave me Adobe Creative Suite, which has Illustrator and InDesign and is super expensive. She gets it on the cheaps through her architecture program. As soon as I learn how to use it all you can expect some exciting things! 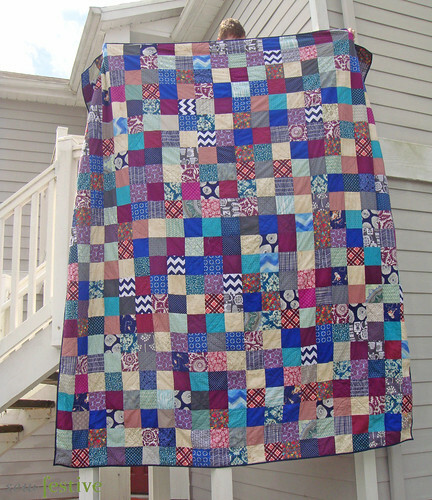 massive quilt, she looks pleased - thats great - lovely colors! This is awesome! I love all the special touches you included--of course your friend loved it! 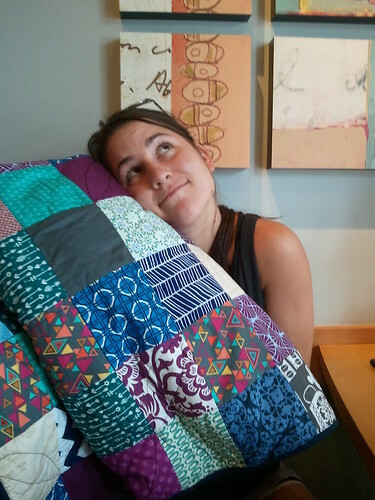 I really love making quilts for other people (actually, the only thing I've sewn for myself so far is a purse!) --it is so satisfying to try to take into account their tastes and to know that they appreciate it! I have a little trouble seeing Kristen Bell. I can only ever think about her in a truly terrible scene in "Deadwood." I actually closed my eyes in time to avoid watching most of it thanks to my boyfriend's warning that I wouldn't want to see what was about to happen, but ugh. Maybe I should watch her in something else sometime to try and erase that scene from my mind! Bravo! Love how you quilted it. It'll stay nice and cozy. How great to have such a wonderful friend!!!! wow, what a project made with love! Really pretty! It looks fantastic! I did a king-sized duvet cover for my mom using the ever popular Swoon pattern. It too started off as simply a quilt for cuddling. But just like in your story my mom said: "you know, I'm thinking I want this to go on my California King bed..." I think all she heard was probably crickets chirping in the background as I tried to pick my jaw up of the floor! THANKFULLY I talked her into the Duvet idea so I wouldn't have to quilt it...so glad she loved the idea! That was a monster project. But I know how you feel; the reaction I got made me realize that I would do it all over again in a heart beat! It just turned out amazing, so worth all your hard work! 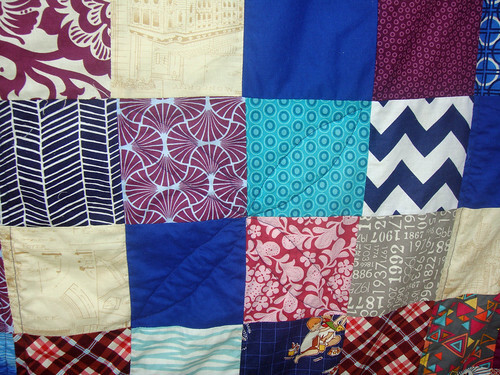 And it's great to hear that it was hard work - so often we all blog about our quilts as if they magically went from fabric stack to finished in the blink of an eye. It's so nice to see someone talking honestly about the slog that they can be at times.